I get this a lot. My pirate books are too violent. Let’s think about that for a moment. 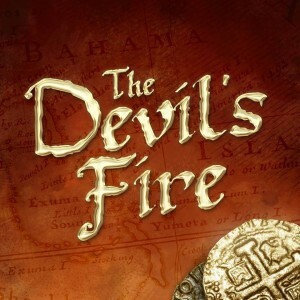 I wrote The Devil’s Fire specifically because I was tired of fanciful, romantic pirate stories. In reality, there was nothing fanciful or romantic about being a pirate. Quite the opposite. It was a horrible life that soured even the most innocent sailors. It is no wonder that after months at sea pirates so viciously swarmed upon the first vessel they came across. Their thirst for water, which was satiated with the poor substitute of rum, was swiftly confused with a thirst for blood. I received an email recently asking if I would be so kind as to edit a young adult version of The Devil’s Fire series. I love the phrase, “Would you be so kind?” because it implies that anything less than compliance would be unkind. The short answer is no, I will not be so kind, because this is not a kind story. It’s a gritty pirate story specifically written for adults. The fact of the matter is pirates are rarely treated seriously in any form of entertainment, and they haven’t been for some time now. There are hordes of romantic pirate novels out there. The modern view of 17th-18th century pirates is far removed from the reality, and I think that’s why the violence and profanity in The Devil’s Fire is so shocking to some readers. Pirates were not nice people, and they did not live long lives. They often died terrible deaths. There were a thousand ways to die in a ship battle, few of them pretty. There is nothing romantic about being stabbed in the gut by a sword or shot in the face with a musket ball… let alone being impacted by a cannonball. Now imagine a woman amidst these starved monsters. Should that be a fun tale? Should she fall in love with the man who murdered her husband? Should she be unaffected by her experience? I’m not interested in telling the story of a complacent woman among pirates, who swoons half-naked in the captain’s arms while the sun sets in the distance. Everyone wants to be a pirate, or at least wanted to be one when they were younger. Pirates symbolize freedom from conformity and responsibility, and that is always a romantic notion. If I’ve done my job, The Devil’s Fire should make you think twice about wanting to be a pirate. Pirates did not lead the easy, happy-go-lucky lives that movies would have you believe. The irony of their lawless abandon is that their lives were typically harder than if they had simply conformed to the societal standards of the time. There is nothing young adult about an innocent woman being kidnapped by pirates. Nor do I think it would be appropriate to turn such a story into a passionate romance. I would have trouble respecting a heroine who gave her soul to the man who destroyed her life. I have no difficulty respecting Kate Lindsay. “The Devil’s Horizon” and “The Devil’s Fire Trilogy” now available on Kindle!